the well-being of a healthy cannabis garden. There are a variety of options that growers can use for greenhouse cooling during the summer months. 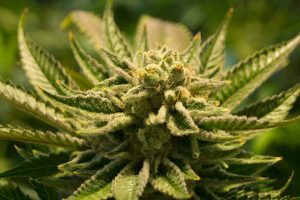 There are a few tricks that can be done for heat issues for those cannabis cultivation operations on a tight budget. These tips are best suited for simple structures – such as hoop-houses – that don’t have many options for automation. For starters, cultivators can design their greenhouse foundations with basic permaculture principles in mind. This process is situated on digging the greenhouse base 3 ft. down into the ground. The ambient temperature within the strata of the earth ranges from between 60-70 degrees Fahrenheit. This simple measure can greatly reduce temperatures on a hot summer day. Summer cannabis growers can also greatly reduce heat issues by simply folding up the walls and removing the ends of greenhouses. This practice leads to a far greater amount of airflow throughout the structure. To aid in this simple process, an inline “outtake” exhaust fan should be mounted at one of the highest points of the greenhouse interior. With this set-up, the outtake fan will help remove hot and humid air at the top of the structure. Cultivators should also use wall fans mounted directly on the greenhouse frame or T-posts. This will aid in the interior airflow of the greenhouse. It is important to note, that in using these passive, slightly-automated cooling measures, gardeners should always use a tall greenhouse frame. This practice will ensure that there is sufficient space between the garden canopy and the greenhouse roof. This is largely because, the very top of the greenhouse has the hottest ambient temperatures as well as the poorest airflow. Permanent greenhouse structures provide the necessary platform for complex, automated greenhouse cooling systems. These are a great choice for those outdoor cannabis gardeners with large-scale ambitions. Permanent greenhouse structures are generally built on solid, level foundations of concrete or gravel. They also have the infrastructural might to support heavy equipment additions. 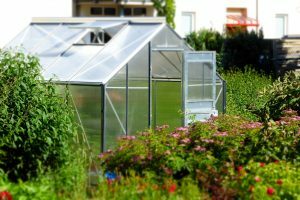 With these notions in mind, all greenhouses fall within two categories: “closed greenhouse systems” and “open greenhouse systems.” These options directly dictate the choice of an industrial air conditioner or a wet-wall for cooling options. Both wet wall systems and AC systems are attractive to summertime greenhouse cultivators. This is because, each method requires that greenhouse walls stay closed. Therefore, privacy from neighbors remains intact and atmospheric regulation is left largely automated. However, industrial AC systems are extremely expensive, rendering them outside the scope of this work. Greenhouse wet wall systems are semi-affordable option for those planning a outdoor cultivation operation. While the installation of a properly working wet wall system should be left to a professional contractor, the overall function of the setup is not too difficult to understand. For starters, at one of the ends of a rectangular shaped greenhouse, a thick, yet permeable cooling panel membrane recirculates water throughout the entire surface area of the wall. This wall-sized panel features a pipe on the upper portion that keeps a continuous flow of water going throughout the membrane. At the end of this process, it drains at the bottom of the wall in a recirculating system. At the opposite end of the rectangular greenhouse, the walls feature large exhaust fans which pull air through the entire length of the structure. The air being pulled through the wet wall membrane and through the greenhouse reduces ambient temperatures inside from 10 to 15 degrees. One should note, however, that the use of a wet-wall system greatly increases humidity within a greenhouse. Therefore, it is essential that an industrial dehumidifier compliments the wet wall system to counteract potential problems with mildew and mold. Also, wall fans are an essential ingredient in keeping an even environmental stasis through the wet wall cooled greenhouse. This article originally appeared in the July 2017 edition of Maximum Yield Magazine.